Broth. Stock. Roux. Sauce. Consommé. These are essential -- foundational, even -- elements to French cooking. The fonds de cuisine demand a chef's most basic, yet essential, skills. Although seemingly simple, they are time-consuming and many home cooks actively avoid their preparation, opting instead for canned or boxed varieties. I am -- or was -- one of these cooks. 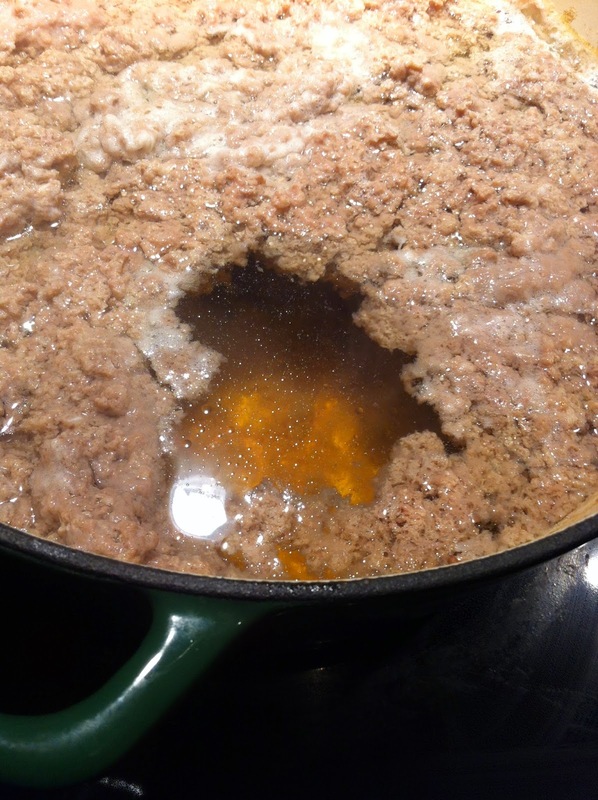 Last year, after a trip to Louisiana, I made my first roux. This year is the year of the consommé. After reading Escoffier's praise of the technical skills needed to make a consommé, I began my research: I went through all my cookbooks, I googled alternate recipes, and watched youtube videos produced by chefs around the world outlining their technique for making the clear soup. When I felt sufficiently confident, I sharpened my knives and turned to my stove. I prepared the broth with two chicken carcasses, vegetables, and water. 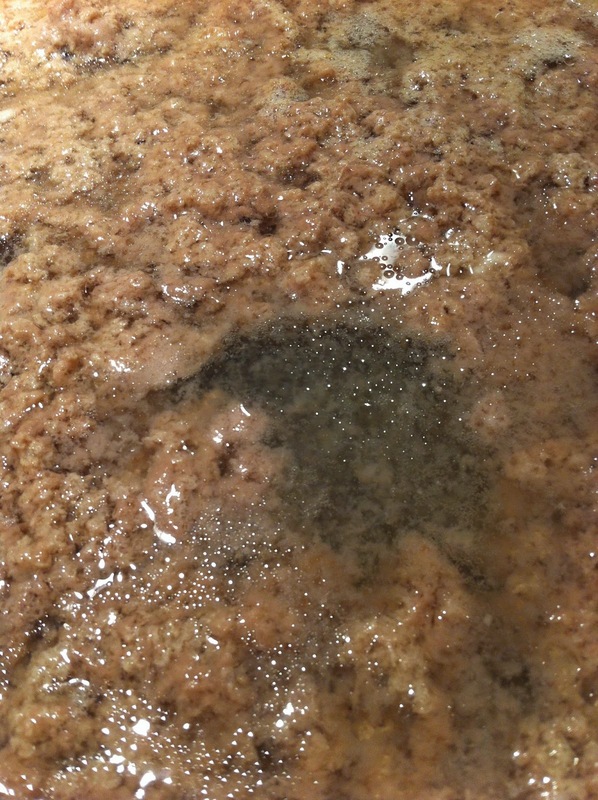 I cooked it slowly, carefully removing the scum building up on the surface. After a couple of hours, I put the pot aside allowing it to cool down before straining its contents. 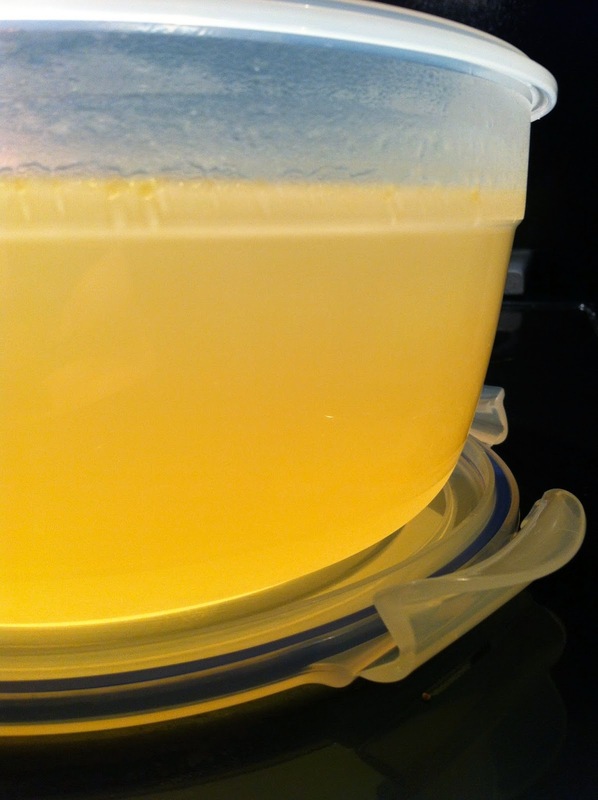 I, then, returned the liquid to a clean pot and began warming it at a very low temperature. The broth at this point was a cloudy golden yellow. In order to achieve a consommé, it had to be clarified. To do this, I mixed lean ground beef with seven egg whites. I tempered the broth into the bowl to ensure that the ingredients didn't cook too rapidly in the hot broth. 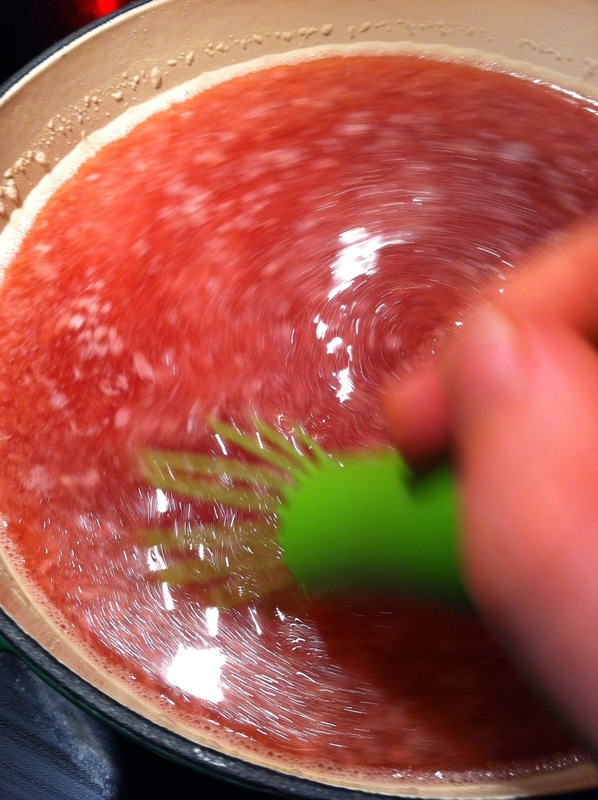 When I dumped everything back into the pot and stirred, I began to panic. Nowhere on the Internet or in my cooking manuals did I see or read about this red-puke color. I kept stirring not knowing if the temperature was too high or too low. I started to doubt myself, thinking I had made a mistake. As the liquid began to simmer, a raft formed and I was able to breathe again. As the proteins heat, they form a sort of net trapping all the impurities in the broth and bringing them to the surface -- this is the raft. I shaped a well with a ladle and let the liquid simmer until it looked sufficiently clear. I, then, strained the liquid through cheesecloth. The consommé looked great, but it needed "a little something" -- a garnish that would bring a "wow factor" to the dish. 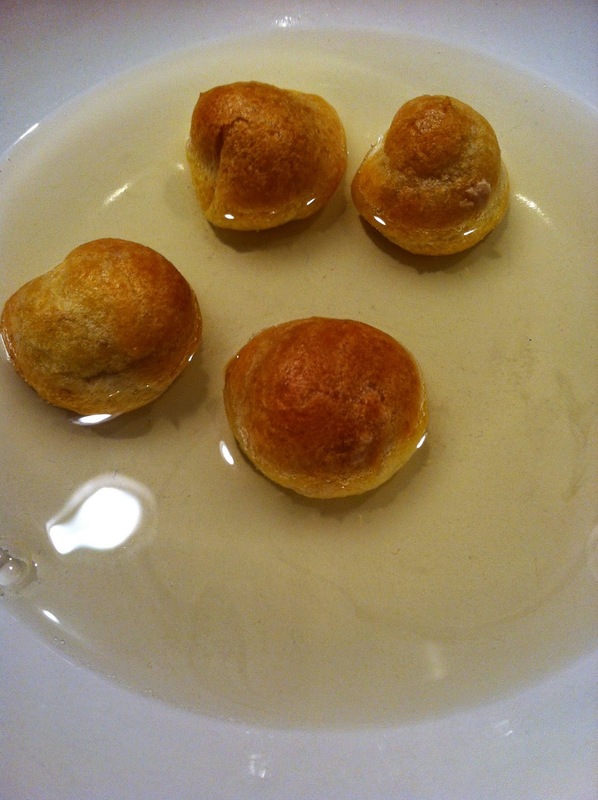 I prepared profiteroles by first making a pâte à choux without sugar. Although Escoffier recommends adding 16 eggs to the batter, I felt I had reached the right texture and consistency after eight. I then used a piping bag to make "hazelnut size" pastries. to end up with 350 profiteroles, like I did. Next, I mixed a spoonful of foie gras with a bit of cream and stuffed the profiteroles. I placed four in a soup bowl and added a ladle full of hot consommé. Voilà! As I ate my consommé, satisfied by a successful day of work, my mind began to wander back to another anxiety-ridden first I'll be facing very soon. This summer, I'll be leading my first university level history course. I'll be designing the syllabus, assigning the readings, and writing the lectures all on my own. Escoffier's advice to the next generation of chefs actually translates well to my own task. "It is just as absurd to exact excellent cooking from a chef whom one provides with defective or scanty goods, as to hope to obtain wine from a bottle decoction of logwood." A history class also requires discussions of the newest and most relevant ideas ... picked ripe from the most recent of historiographical debates. I'll keep Escoffier's words in mind as I prepare for my class, but when it begins and I'm in front of all of my students, I hope I'll remember the day I had in the kitchen making this dish. Despite having done all the necessary research and being well prepared, I still had moments where I doubted myself. I'll try to remember that when I didn't get immediate results from the raft, I didn't abandon ship -- I trusted the process and allowed the ingredients to do their work. When it came to the pâte à choux, I followed my instincts and was able to adapt on the spot. Hopefully, I'll be able to do the same in the classroom. I hope the class I end up teaching will be like this consommé: its appearance deceivingly simple, its elements complex but well thought out, and garnished with golden nuggets adding a pleasantly surprising flavour and texture...but at the same time bringing into question the traditional components of the dish. "no theories, no formula, and no recipes, however well written, can take the place of practical experience in the acquisition of a full knowledge concerning this part of the work -- the most important, the most essential, and certainly the most difficult part." I'm aware that I don't have the same tools as a seasoned chef. I don't have the same scars on my hands as mementos of past mistakes. As an apprentice, I'm still learning the classic techniques, and haven't made them my own yet. Having experience is "most essential," but getting that experience is "the most difficult part." The anxiety that I feel stems from knowing that failure is as much a possibility as success. I may try to innovate in the classroom and see myself as a forward thinking pedagogue, but there's only one way of finding out if my approach is successful: I have to try it. If it isn't successful, I'll have to learn from my mistakes, readjust and try again. You only need to burn one roux to know that you never want to burn another, but you only need to make one fantastic consommé to understand why that extra effort and patience is all worth it.